This course will involve lectures, projects, and tours about the making of urban India in the past century and consequences of urbanization. 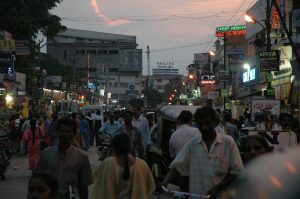 It will address topics such as urban-rural relationship; labor flows; cultural diversity; mass media; the making of the new urban Indian middle class; gender and public space; development organizations and NGOs; the relationship of the state to city planning of transportation, building, and housing. Students will conduct research on a preferred topic in either Bangalore, Chennai, or Hyderabad.